South Devon College is delighted to announce that the first cohort of Laboratory Technician Apprentices have successfully completed the Apprentice standard, passing their crucial final End Point Assessments with flying colours. 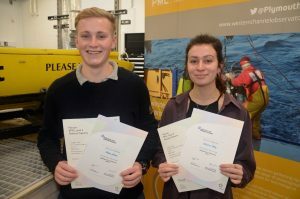 Delivered in partnership with the dedicated team at Plymouth Marine Laboratory (PML) and funded through the Lloyd’s Register Foundation (LRF), the College students Oban Jones and Rebecca May are amongst the first in the country to claim such a feat following the establishment of the Apprentice standard in May 2016. Described as the essential collection of skills, knowledge and behaviours for which aspiring apprentices work towards, the Apprentice standard certificate is a way of showing full competence is reached for a particular occupation. South Devon College Lecturer in Marine Science, Dr Andrea Gaion said, “It’s a pleasure of mine to see the great determination and efforts shown by both students pay off. Throughout the last couple of years both have worked extremely hard to pass their assessment and complete the challenging standard. From the very first day Oban has been highly focused, quickly understanding the connection between what’s taught at the College and the practical skills gained through working at PML. Working in the different laboratories and performing science on PML’s research vessel the Plymouth Quest, it’s impressive to see the wide range of skills and knowledge Oban has developed. I am sure he’s made a highly valuable contribution to the excellent work the team at PML achieve and we wish him a successful future career in the Marine Science sector. I’ve also had the privilege to witness Rebecca’s development and growth upfront. Her passion for marine science has really shone through in both her studies and work. I was very pleased when she was granted the opportunity to partake in the the PML-led oceanographic expedition -the Atlantic Meridional Transect (AMT), where she worked in close contact with different scientists at sea for two months. This unique experience has been inspirational for her as well as many others at the College. Rebecca’s progression is a perfect example of the benefits partnerships between education providers and employers can make towards students future career prospects”. The success of the Laboratory Technician students is owed largely due to the continued support from the team at Plymouth Marine Laboratory (PML) and the Lloyd’s Register Foundation. The College appreciates the considerable efforts made by PML throughout the duration of the apprenticeship, improving the learning experiences of the students through putting in place very thorough training plans, and providing data needed for the student’s Final End Point Assessments.